The Dodgers are 1-0 with Manny Machado. 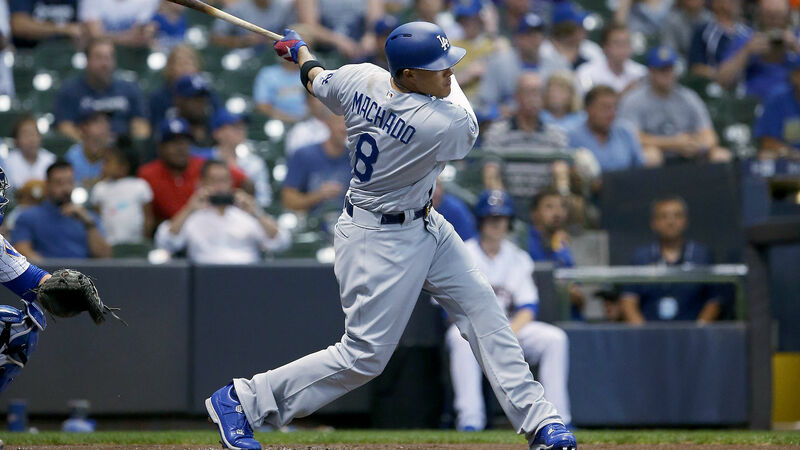 Los Angeles opened the second half with a 6-4 victory over the Brewers on Friday at Miller Park. The win moved the Dodgers to 54-43 on the year while Milwaukee fell to 55-44. Los Angeles acquired Machado from the Orioles in exchange for five prospects during the All-Star break. He batted second and tallied two hits in his Dodgers debut. He also walked twice. The Brewers trailed 3-2 heading into the ninth inning. But, Los Angeles extended its lead on a three-run home run by Enrique Hernandez. Milwaukee outfielder Christian Yelich drove in two runs with a triple in the bottom of the frame before Dodgers closer Kenley Jansen struck out Jesus Aguilar to end the game. Starter Rich Hill allowed one run in six innings to pick up the win for Los Angeles. The Brewers bullpen combined to surrender five runs in three innings pitched. Matt Carpenter went 5 for 5, hit three home runs and tallied seven RBIs in the Cardinals’ 18-5 win over the Cubs. Giants starter Dereck Rodriguez allowed just three hits and one run against the A’s. He also struck out five. Orioles reliever Mychal Givens allowed three hits and two runs in his one inning of work against the Blue Jays. Toronto topped Baltimore 8-7 in extra innings. Diego Castillo surrendered two runs and recorded just one out in the Rays’ 6-5 loss to the Marlins. Rays second baseman Joey Wendle charged a high chopper and made a quick glove flip to rob Marlins slugger Justin Bour of an infield hit. Mets (40-55) at Yankees (62-34) 1:05 p.m. ET — The Mets and Yankees will continue their three-game Subway Series on Saturday. Steven Matz (4-7, 3.38 ERA) is set to take the mound for the Mets while Sonny Gray, who currently holds a 5.46 ERA, will start for the Yankees. The Mets opened the second half with a 7-5 victory at Yankee Stadium on Friday.